YA literature is juicy, hot, delicious, and filling -- but is that enough? Whether you’re a young-at-heart adult like us, or a real live bona fide teenager, we could all use some variety in our literary diet. 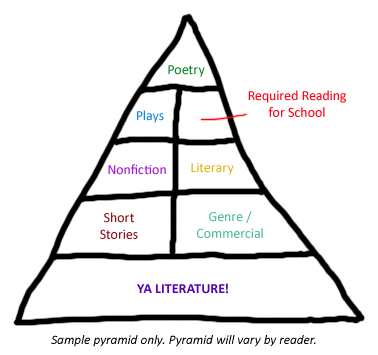 It’s like the food pyramid, but with books: consuming different genres, styles, and subjects will help you grow strong and healthy bones -- er, brains. So if you’re trying to figure out how to add veggies and fiber to your reading feast, we’ve got a few tasty ideas. Recently we stumbled onto this absolute GEM of a book. Seriously, go get it now and be prepared to transform. You will laugh and groan at Victoria’s social ineptitude. You will scream at her when she is SO FREAKING CLOSE to happiness but still can’t figure out how let herself have it. Your heart will break and mend, break and mend. Do yourself a favor and read this book. It’s too lovely not to. Maybe you’ve heard of this one? (Or watched it. Mmm, Colin Firth…) Well, even if you’ve seen the movie, the book is worth a read. But be warned: you might find yourself snorting with laughter, so don’t drink anything unless you’re cool with it coming out your nose. Bridget Jones’s Diary is the devastatingly self-aware, laugh-out-loud daily chronicle of Bridget’s permanent, doomed quest for self-improvement -- a year in which she resolves to: reduce the circumference of each thigh by 1.5 inches, visit the gym three times a week not just to buy a sandwich, form a functional relationship with a responsible adult -- and learn to program the VCR. Over the course of the year, Bridget loses a total of 72 pounds… but gains a total of 74. She remains, however, optimistic. In a world full of vampires, werewolves, and fallen angels, not to mention evil governments and brutal battles to the death, we could use an awkward, optimistic heroine. Bella may be wish fulfillment, and Katniss may be a role model, but Bridget Jones is real. Bridget Jones is the everywoman. Bridget Jones is funny, ridiculous, British. What more do you need? Well, those are our ideas for today. What about you guys? Read any good non-YA lately? LOL--your pyramid totally cracked me up.I completely agree. Even though YA makes up much of my pyramid base, I'd have to add in urban fantasies. They're like candy to me and I can't "eat" just one! Kristan...that pyramid is hysterical! Love it! Love it! And I completely love The Language of Flowers. I can't look at flowers without thinking of their meaning now! Might have to send some messages (irises) to my favorite peeps. I don't remember what irises mean, but I'd love to get a flower message from you! I absolutely adore YA, but, fortunately, enjoy other genres enough that I don't feel like I'm having to force myself to read them. Incidentally, awesome blog! Four women coming together and writing YA stories--how have I not found this before? If any of you would like to submit to me, I'm searching for a May 2012 Author of the Month to showcase and I'd love to read some of your stuff! There are instructions in my latest blog post. I've only gotten literary fiction so far this month and am hungering for some good YA! I am ALL about a varied literary diet. I read YA, adult fiction, non-fiction...anything that interests me! LOVE the pyramid! I think since I started blogging in June 2010 my diet has consisted of a lot more YA than it had before. BUT I think, before that, YA was severely lacking in my life. Had to catch up haha! LOVE this post. Thanks for stopping by! Your blog looks great.